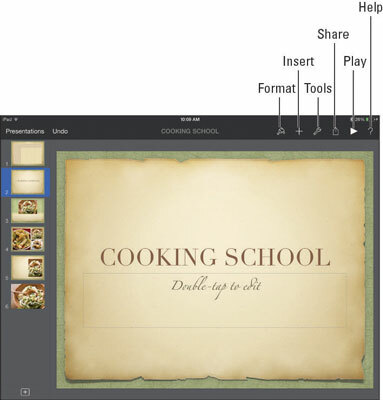 When you open (or create) a Keynote document on your iPad, the basic Keynote screen appears, as shown in this figure. The name of the document is centered on the toolbar at the top. At the left, the Presentations button returns you to the Presentations screen where small images represent the first page of each of your saved files. Insert: Lets you insert media such as photos, tables, charts, and shapes, as shown in this figure. Tools: Shows you the popover you see in this figure. 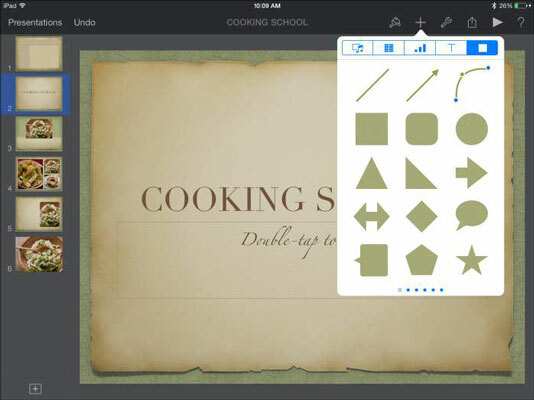 You can use various tools to add transitions and builds, find text in the presentation, work with Presenter Notes and Presentation Tools, work with Settings, set a password to protect the Keynote document, Print, or go to Help for assistance with using the application. Share: Share by using iCloud; sending a copy via AirDrop, Message, or Mail; or by opening the presentation in another app in a format such as PDF. Play: Use this button to play your presentation; if you have an external display adapter, the slides appear on the display while the iPad screen shows the controls. Check Spelling: Turn on this option to have Keynote alert you to spelling issues as you type. Slide Numbers: This option lets you turn slide numbers on and off. Just as with pages of a Pages document, you should let the app handle the numbering so that the slide (or page) numbers are correct even if you move elements around, delete slides, or add slides. Guides: The Guides option on the Advanced menu makes a setting available to display guidelines that appear as you move an object toward the center of the slide or other objects, at the edges of the slide, or in 10-percent increments horizontally and vertically along the slide. You can choose which style of guide you want to appear. Comments: Tap this selection to turn Comments off or on. When you turn them on, small yellow sticky notes appear in a presentation wherever there’s a comment. 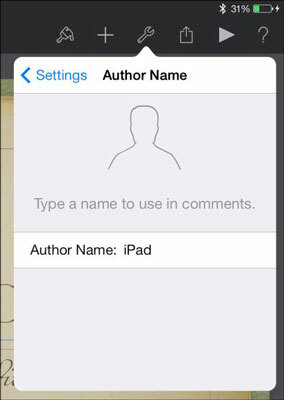 Author Name: Tap this option to enter a name for Keynote to use in any comments you insert (see the figure). One difference between Keynote and the other iWork apps is that it always appears in landscape (horizontal) orientation; as you rotate the iPad, the image doesn’t rotate because the slides are all designed to be shown horizontally. It isn’t a Keynote limitation as much as a nod to most of the realities of projectors and displays. On the left side of the screen, in the navigator, are thumbnail views of the slides in your presentation. To go to any slide in your presentation, just tap its thumbnail.